Diyarbakır, the unofficial capital of the Kurdish people, has been one of the main locations of armed conflict between the PKK and the Turkish state. Since August 2015, numerous curfews have been declared in the city and its villages, hundreds of civilians have been killed, the centre of the 5000 year old city Suriçi was bombed, and half of the old city was totally destroyed. The curfew still continues in the old city Suriçi. Today is the 333rd day of the curfew. Right now, the city is undergoing another trauma. 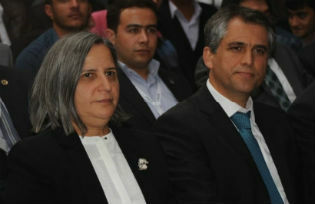 Two days ago, the co-mayors of Diyarbakır, Gültan Kışanak and Fırat Anlı, were detained by the Turkish police with the allegation that they are “supporting the PKK terror organization”. Kışanak was detained in Diyarbakir Airport, on her way back from Ankara, while Anlı was detained at his home in the center of Diyarbakir. According to the press release of the Diyarbakır Chief Public Prosecutor’s Office, Kışanak and Anlı were detained due to statements they had made, under laws governing their rights to freedom of speech. Following their detention, all internet connection was cut across the Kurdish region. 6 million people have been cut off from the world for the past 3 days. Why did the Turkish government cut off internet in the Kurdish region? The government is trying to prevent the mobilization of Kurdish people through social media. Kurdish people are very angry because of the detention of their co-mayors. They want to protest. The government has prohibited all kinds of protests, gatherings and marches under the Emergency Law. This blackout also aims to silence the voices of the Kurdish people, to prevent them from informing the national and international public about developments in the region. What has happened in these two “dark” days? The municipality building has been completely closed by police barriers, panzers and thousands of police officers. Even municipal staff have been forbidden to enter the building. On the first day, hundreds of people tried to gather in front of the municipality building. The police tried to prevent the people from gathering and protesting. It was a hard day, full of tear gas and water cannon. The police did not only use tear gas and water, but guns were turned against protestors as well. Many people were injured by police violence. At the end of the day, 37 protestors, some of them Kurdish politicians, were also detained. Thousands of Kurdish people gathered in front of the municipality building on the second day. The co-president of HDP, Selahattin Demirtaş gave a speech to the crowd of people. He said that the Kurdish people will not accept the detention of their co-mayors and encouraged people to continue their peaceful protests until the release of the co-mayors. Kurdish cities have witnessed outrage, killings and bombings all year. Just a month ago, on 11 September, 27 elected mayors were replaced by appointed state officers, 11,285 Kurdish teachers were fired from their jobs. Hundreds of Kurdish politicians and activists have been detained. Almost all Kurdish media, even the Kurdish childrens’ channel have been closed down. As of today, 27 elected Kurdish co-mayors are in prison in Turkey, while 43 of them were dismissed. The detention of Diyarbakır’s co-mayors is an important phase in a year-long process. While looking at my municipality, which has been under police blockade for 3 days, I wonder if the Kurdish people will accept these humiliating policies. As a member of the Kurdish society, I can easily say NO. Kurds are part of a very organized society, a resilient society, struggling for their rights for more than a century. They will continue their struggle, though I believe these policies risk the future of Turkey as a country. Nurcan Baysal is a Kurdish author who has published numerous books and articles about Turkey’s Kurdish issue.